3 stars is a bit harsh for this. It really should be 3 1/2 stars as I did really enjoy it but it's certainly not up there with some of the 4 star books I've read this year. You can blame good reads for the low mark. 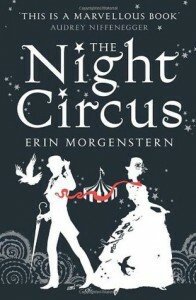 The Night Circus is just lovely. A fairly enchanting book that's been perfect to read on these dark miserable days. It's a quick, easy atmospheric read. A couple of minor flaws for me...Firstly, the first chapter read like a screenplay. One of my pet peeves these days is authors writing books like movies. I wouldn't be at all surprised to see a movie of this soon. Secondly, I found the dialogue a little faux-victorian. Worth a read though as it is quite magical and inventive.